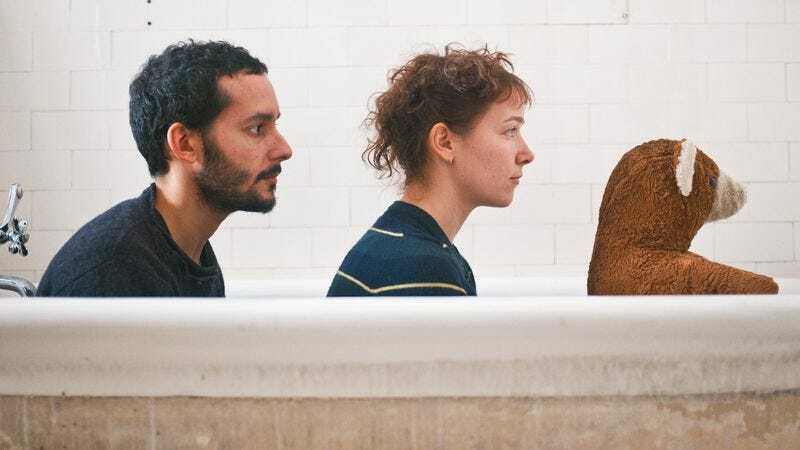 Fans of unusual instruments and wacked-out time signatures will like Buke And Gase, a New York duo that’s been making left-field tunes since 2008. Composed of the similarly named Arone Dyer and Aron Sanchez, the group revels in its offbeat nature, using big but spare percussion, tiny guitars, and copious amounts of electronics to create its intense tunes. Think Tune-Yards, but with less yelping. With Beautiful Creatures on the horizon and a new season of Shameless currently airing, it makes total sense that Emmy Rossum would want to capitalize on her childhood vocal training and years of singing and drop a new record. Her first, Inside Out, was full of original songs and came out back in 2007 to little fanfare and meager sales. This time around, she’s hopped in the wayback machine to record a series of covers of songs released anytime from the ’20s to the ’60s. That kind of material can be charming if done well, but on Sentimental Journey, it’s saccharine sweet and annoyingly adolescent. Tracks like “(I’ll Be With You) In Apple Blossom Time” are so gloopy they sound like Rossum coated her throat with Karo syrup before singing. Listen at your own diabetic risk. On Get Up!, Harper teams with his childhood hero, master harmonica player Charlie Musselwhite, for some blues-infused roots rock. Though Destiny’s Child’s schlocky love ballads were never its strongest material, that doesn’t mean that the group’s fans won’t gobble up this new greatest-hits record highlighting that dreck. The group even recorded a new song, “Nuclear,” for the comp. Real Estate guitarist Matt Mondanile has been dabbling around with side project Ducktails for a while, but it’s finally come into its own on this new record, which features production help from Daniel Lopatin, a.k.a. Oneohtrix Point Never. The legendary country songwriter’s latest record is his first new material in four years and his third in a row with producer Don Was. Recorded over just three days, the record focuses on the now-76-year-old Kristofferson’s struggle with his own mortality. Produced by New Found Glory’s Chad Gilbert, No Fairy Tale is Loeb’s first new rock record in eight years. Two of the songs were written and recorded with Tegan And Sara, who also have a record out this week. Local Natives hit it big with their last record, Gorilla Manor, which earned the coveted “Best New Music” tag on Pitchfork back in 2010. Hummingbird doesn’t have quite the quirky catchiness of Gorilla, but it’s worth a listen all the same. Now in its second decade, Mice Parade is made up of primarily Adam Pierce, though he pulls in different guest musicians for each record. Candela is the band’s seventh, and is named after a flamenco bar in Madrid. Radar Bros. have been around for a while, but the band’s still making vivid and vital material. Eight is the band’s eighth record (get it?) and will be released only on LP and via digital outlets, so CD nerds—if there are such people—are S.O.L. Sister duo Tegan And Sara’s latest record takes them in a more dance-pop direction than their previous work, but that’s a-okay with us. The album’s first single, “Closer,” even sounds a little bit like a Robyn cut. For a band full of heavy hitters—Faith No More’s Mike Patton, Jesus Lizard’s Duane Denison, et al—Tomahawk hasn’t really made all that much of a lasting splash with listeners. Oddfellows, the band’s first really solid record, could turn that all around, though. Since changing its name from the lawsuit-baiting Reading Rainbow, Bleeding Rainbow has changed its sound as well, going from lo-fi garage pop to denser, more epic jams somewhat reminiscent of the Jesus And Mary Chain. One-man Danish band Indians consists of just Soren Lokke Juul, but sounds much bigger. Somewhere Else is the blog-darling act’s first record after forming just last year. The Ruby Suns made a big splash with their self-titled 2005 debut, which blended all sorts of world-music sounds together into pleasing indie-rock jams. The group, fronted by Ryan McPhun, hasn’t made anything as winning since, but there’s always hope for the future.